As I continue to read my way through this series, I’m beginning to notice emerging themes and preoccupations of these excellent books. In The Laughing Policeman the overriding sense is of life wasted and how a private obsession can spiral into something catastrophic. The book opens with a mass killing on a Stockholm bus. Eight people are killed and the sole survivor is only able to utter barely intelligible sounds when police ask him to identify the killer. On the bus was an off-duty detective, Ake Strenstrom, who managed to draw his gun before he was killed. Inspector Martin Beck and his assistant Kollberg are perplexed by Strenstrom’s presence amongst the dead. Unless he was involved in an investigation, he shouldn’t have been carrying his service revolver. However, when Beck and Kollberg interview Strenstrom’s girlfriend it becomes clear that he was attempting to solve a cold case, the murder of Teresa Camarão which took place years earlier. The team are forced to retrace the steps of the original investigation to discover the killer involved in both cases. Despite the presence of mass murder, the tone of the book is as I’ve come to expect, sober and restrained. Beck approaches the investigation in his usual methodical manner, judging and not-judging at the same time. The Stockholm police are as varied as ever. The luckless Kristiansson and Kvant who are slow to discover the mass killing and contaminate the scene of the crime are given a dressing down by their superior but supported by Martin Beck who seems to realise there is more at stake than simple police incompetence. There are moments of grim humour. The dead Strenstrom had photographed his long-term girlfriend in a number of sexual positions to try to enter the mind of the dead Teresa. The detectives are embarrassed to find the photographs in Strenstrom’s desk and Kollberg in particular seems to find the images perplexing. The writers are wonderful at writing understated prose, especially about relationships. There is a particularly moving scene where Beck is terrified that it is Kollberg who is the policeman who has been killed on the bus. I found the ending of the book slightly flat. The laughing policeman of the title is a reference to the song made famous by Charles Penrose. At the end, Beck laughs humorously at something he finds, but there is rarely a feeling of hope in the books of Maj Sjöwall and Per Wahlöö. But as expected I very much enjoyed this book and once more was impressed by the inventiveness of this writing duo. I bought my copy of this book. Other reviews can be found at Eurocrime, Crime Segments and Avadhut Recommends. 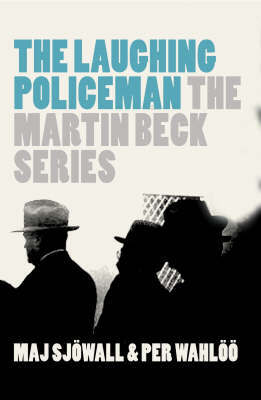 Ahh – I had heard that Martin Beck’s life takes a turn. The books are certainly leading up to something. In the introduction, it mentions the Hollywood film leads up to the bus murder which seems a little odd as the structure works so well in the book i.e the massacre and then unravelling the case backwards. No surprise that the film tinkered with the plot though. Sarah – An excellent review. You’re quite right about the restraint in this novel, especially considering the shooting, the riot, etc.. One of the things that also impressed me about this novel was the way the larger issues talked about in the book are brought down to the human level. I hadn’t thought about that Margot but everything is brought down to a huan level in a very subtle way. Another theme of the books I think. Thanks for this wonderful review. The Laughing Policeman was the first Sjowall & Wahloo novel that I ever read, so it will always have a special place in my heart. And I always think that in Beck we can see shades of what Mankell’s Wallander and Indridason’s Erlendur will come to be… Truly groundbreaking stuff. It was my first Beck too, and still my favourite. Thanks Mrs P. Yes I can definitely see shades of future Scandinavian detectives. Beck’s laid back style is definitely appealing although the disintegration of his marriage is quite sad to read about. It reminds me a bit of One Step Behind, in which Svedberg is revealed to have been leading a secret life. This is the second Sjowall/Wahloo book I read and the only one I own. After I read it, I saw the Hollywood movie. What a disappointment. I didn’t even recognize the Swedish authors’ plot, characters or style. It was a big, loud, fast-paced movie with sleazy, stereotypical characters and noisy car chases. No subtlety, which is a trademark of the writing duo. So don’t bother seeing it unless you like being aggravated. A friend who is the one who told me about Sjowall and Wahloo just reread The Locked Room and enjoyed it again. Maybe I’ll reread The Laughing Policeman. Thanks Kathy. I’m interested to see if I will fancy re-reading the series when I have finished it. If I can catch the film sometime I would be interested to see it but from the comments above it sounds like I’ll be disappointed. I’ve enjoyed your reviews of this series, and I hope to start reading it soon. I just ordered Roseanna. I think you’ll enjoy ‘Roseanna’ Rebecca. Glad you’ve liked the reviews!